Good for the younger Keiki. 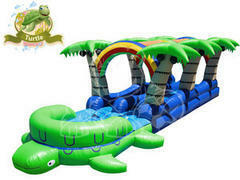 Wide lane slide into a large pool! 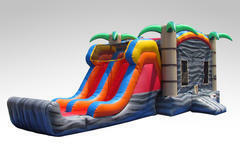 15' Tropic Rainforest Water Slide - Single lane front entry slide with pool. 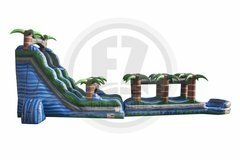 22' Blue Crush & 30' Slip & Slide - not for the faint of heart! Available wet only. 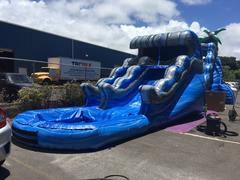 22' Blue Crush water slide! 27' Volcano Falls - largest slide on Maui! Slide down fissure 8 into a pool of cool, clear lava......not for the faint of heart! 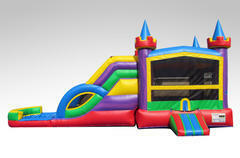 Jr. Lucky Water Combo - bouncy castle & water slide perfect for ages 3 & up! 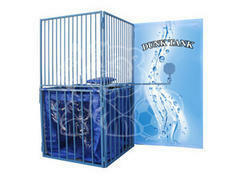 Available wet or dry. Please call to reserve dry or order here wet. 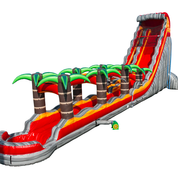 Swish down a two lane slip 'n slide & fight your way through a tropic jungle to freedom - down a two lane water slide! 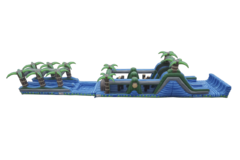 30' Tropical Slip & Slide. 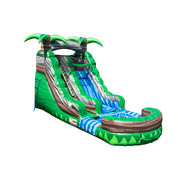 Order here for the slip & slide or order with the 18' Purple Crush for an extra dose of fun! 36' 2 lane slip & slide with a pool finish. Race your friends to the finish line!